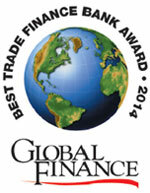 New York, January 22, 2014 - Global Finance magazine named the World’s Best Trade Finance Banks 2014 at the BAFT-IFSA Global Annual Meeting in London on Tuesday evening. Winners were chosen by country, region and globally and the full, exclusive survey and report will be published in the February 2014 issue of Global Finance . The editors of Global Finance selected the best trade finance providers in 76 countries and 7 regions, based on input from industry analysts, corporate executives and technology experts. In addition, a poll of Global Finance ’s readership was conducted in order to increase the accuracy and reliability of the results. Criteria for choosing the winners included: transaction volume, scope of global coverage, customer service, competitive pricing and innovative technologies.